Prosecutors in Cook County, Illinois on Tuesday dropped all charges against out actor Jussie Smollett, angering Chicago Mayor Rahm Emanuel and the Chicago police department. 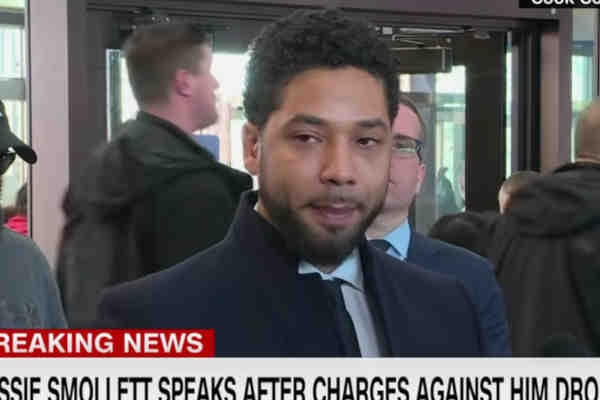 Earlier this month, Smollett, who is black and gay, pleaded not guilty to 16 counts of disorderly conduct in connection with allegedly lying to investigators about being the victim of a racist and homophobic attack that took place January 29 in Chicago. Police, who initially investigated the incident as a possible hate crime, accused Smollett of orchestrating his own attack because he was “dissatisfied with his salary” on the Fox drama Empire. At an emergency court hearing in Chicago, Smollett was told that all charges against him had been dropped and that the case had been sealed. “After reviewing all of the facts and circumstances of the case, including Mr. Smollett’s volunteer service in the community and agreement to forfeit his bond to the City of Chicago, we believe this outcome is a just disposition and appropriate resolution to this case,” prosecutors said in a statement. Speaking to reporters, Smollett said that he has been “truthful and consistent on every single level since day one” and was ready to return to work. Appearing on CNN, Emanuel said that the outcome was a “whitewash of justice.” Chicago Police Superintendent Eddie Johnson told reporters that justice was not served.